This must be what Dorothy felt like, I think. Maybe. If Dorothy was six scared teenagers and Oz was hell. 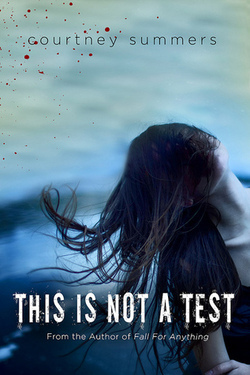 I have to admit, I was nervous about reading Courtney Summers’ new book, This is Not a Test. Not because I don’t love her writing—I do. Some Girls Are is a book I recommend all the time. Not because I don’t like zombies—I do. I love 28 Days Later, The Walking Dead and Zombieland. It’s just that I couldn’t get my head around Courtney’s amazing contemporary style meshing with an zombie story. Obviously, I am an idiot, because This is Not a Test is one of the most memorable books I’ve read this year. This is Not a Test is a zombie novel, yes, but it’s also a story about survival—survival in many forms. Sloane’s life is hard, really hard. Her world fell apart six months ago when her sister left home, leaving her alone with their abusive, controlling father. She doesn’t want to go on and is planning her suicide. Sloane’s world is simply that bleak. In one of the most intense and disturbing opening chapters I can recall, the sudden arrival of a zombie hoard thwarts her plans, and she, along with five other teenagers, find themselves thrown together, struggling to survive, when they take refuge in their high school. The problem is—aside from the zombie horde banging THUD, THUD, THUD on the school’s doors and windows—Sloan doesn’t want to survive. Nothing has changed for her. She’s still alone, she still has no reason to keep going—even less reason, really. The thing is, Sloane finds herself surviving, despite her intentions otherwise. This is where This is Not a Test distinguishes itself from most zombie stories—it’s a psychological novel, driven by character, not its action. Sloane is still suicidal. She’s still angry at her sister. She wants the zombies to breech the fortified doors of the school. Thud. Tears stream down Harrison’s cheeks. Thud. He covers his ears. Trace and Grace hold hands. I hold mine together in front of my face, the edges of my thumbs against my lips like I’m praying and I am praying. I wasn’t raised to believe in God, but sometimes when I ask for things to happen, they happen. This is what I want to happen: I want the doors to burst open. Courtney Summers’ books are distinctive for a number of reasons, but they always stick with me because of her difficult characters that I don’t find particularly relatable or even likeable, and yet, I care about them and want the to move forward in their lives. This is amplified in This is Not a Test, in which Sloane is so inwardly-focused and self-destructive that I didn’t know even what to think of the other characters, because seeing them through Sloane’s first-person point-of-view was so hazy. And yet, as the events of the novel unfolded, and the situation became more tense/intense, I kept wish and hoping for Sloane to see that there was something worth fighting for: Herself. Kelly at Stacked wrote a great review of This is Not a Test, and commented that there’s not a romance in this book (there’s really not, in my reading either—there have been other reviewers who read it differently). And yet, the strange connection between Sloane and fellow survivor Rhys is a plot point that stuck with me, and left me thinking long after I’d finished the book. …it’s just me and him, but it’s not really me and him. It’s just this emptiness between us, the stupid idea I could kiss it away, and I’m crying before I can stop myself and then we’re on the floor and his arms are all around me and I keep saying I can’t because I don’t know what else to say. He tries to calm me, quiet me. Brings his hand to my face, tells me it’s okay. It’s not okay. I’m dying. I am dying. I have finally achieved what I set out to do. My heart is splitting open and I breathe in but no air gets into my lungs. I push against Rhys but he won’t let me go, so I lean into him, curl my fingers into his shirt and sob and the only thing that makes me feel okay about it is the fact that Cary broke down before me, Grace, she broke down before me, Harrison. But still, every second like this hurts, it hurts so bad I can’t stand it. I want it to stop, that’s all I’ve wanted. I let go of Rhys’s shirt when my fingers start to ache. I let him go, but his hold on me never wavers and it is so quiet. The moments of intimacy and emotion are almost painful, they feel like moments stolen from the fight for survival—and yet, they’re so necessary to maintain some semblance of humanity. Summers went in a risky direction with these two characters’ interaction—and that make This is Not a Test a much stronger novel. It’s what Sloane and Rhys need at that moment and it makes this brutal story feel even more real. She could have allowed Rhys and Sloane to have a Big R Relationship, but that would have been the easier path, one that would give readers and easy thing to root for. Instead, she gives us tiny moments where these two survivors connect—and then separate. Because that’s all they can have at that time. As a reader, I tend to grab the little nuances of the relationships between characters and I found the scenes between these two to be fascinating and difficult. The thing no one tells you about surviving, about the mere act of holding out, is how many hours are nothing because nothing happens. They also don’t tell you about how you can share your deepest secrets with someone, kiss them, and the next hour it’s like there’s nothing between you because not everything can mean something all the time or you’d be crushed under the weight of it. And that’s the thing of it, why the Sloane-Rhys storyline is so stand-out: They can’t have a deeper connection, it would just be too much. Some people have described This is Not a Test as “The Breakfast Club with zombies,” and I feel like this could not be further from the truth. It just doesn’t have that same feeling. If I compared it to anything, it would be the first three books in the Tomorrow, When the War Began series (which read almost as a single book), but with a challenging narrator. There’s that same urgency of survival mingled with the carryover of the tough problems pre-catastrophe (zombies in TiNaT, an invading army in TWTWB). I think that’s unusual in this sort of YA fiction. One of the things that often gives me pause in post-apocalyptic novels is that they at times feel like there’s a clean slate created by The Big Event. That most certainly is not the case in Summers’ book. All of the baggage and troubles live on—just made more difficult after the zombies arrive and basic survival is thrown into the mix. Finally, the conclusion to This is Not a Test is one that people will read differently. Without spoiling anything, my perception of the end is that of hopefulness. Nothing is “resolved” in a traditional manner, no one is magically fixed and there’s no tidy conclusion. And yet, I had to hope that something good would happen to the survivors in This is Not a Test. That there was a reason behind their struggles. If you’re reluctant to pick up this one because of the zombie label (like I was), I think you’ll find yourself surprised—This is Not a Test defies genre and the message, whatever you want to believe that may be, lingers in the best possible way. “Makes you think, though. The apocalypse: one big existential crisis.” He cracks a smile. “But whatever, right? FNL Character Rating: Waverly, but with J.D. McCoy as a father.